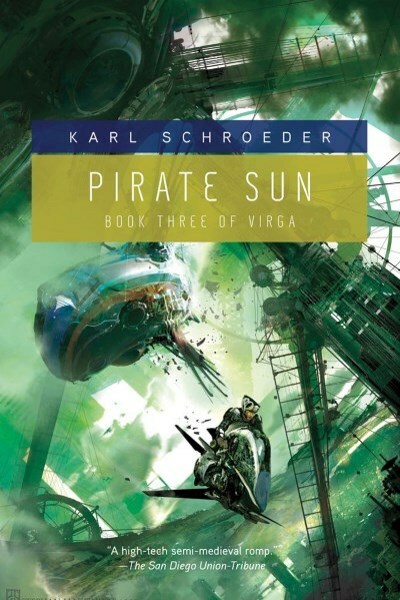 Sun of Suns by Karl Schroeder starts out flat out hard to understand. Not the writing, or the language, or even the plot (though it does take a while to fully unfold). It's the world itself that took me way too long to comprehend. 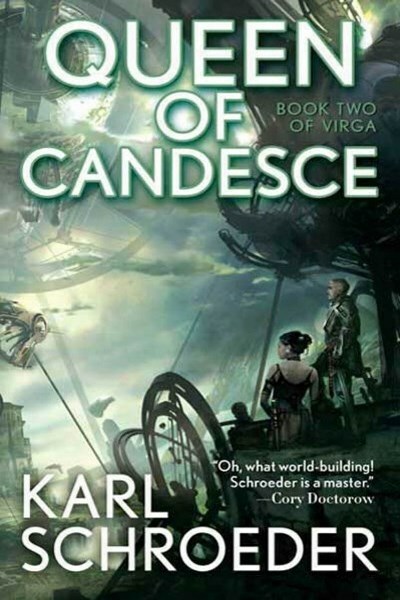 The setting is a sort of blend of science fiction and steampunk and takes place on a planet called Virga. Maybe 'planet' is the wrong word. The description on Amazon defines Virga as a "planet-sized balloon", which is about right now that I think about it. But that fact was never understood, at least not by me. I figured Virga for a gas planet because there is no surface, but, to confuse things a bit more, there are artificial suns within the 'balloon'. People travel about inside this balloon using ships armed with rockets and protected by hosts of flying motorbikes. At one point, they travel to the outer (inside) edge, but can go no further. There is a sentient, all-powerful race outside the balloon, and presumably they're the ones who keep the people inside (?). Again, confusing. All that strangeness aside, Sun of Suns is a surprisingly entertaining novel: Hayden Griffin wants revenge on the man responsible for killing his parents and forcing the subjugation of his nation. Admiral Chaison Fanning of Slipstream is that man. But as Hayden gets close to the admiral, intent on killing him and selling his own life in the process if necessary, he comes to learn of a threat more dangerous than Slipstream that the admiral intends to meet head on. Forced to join Fanning's crew from circumstance if nothing else, Hayden finds himself growing attached to certain Slipstream crewmembers and unwilling to carry out his original mission. Schroeder has quite the imagination when it comes to world-building. I only wish he'd stopped for a moment to explain it a little better. 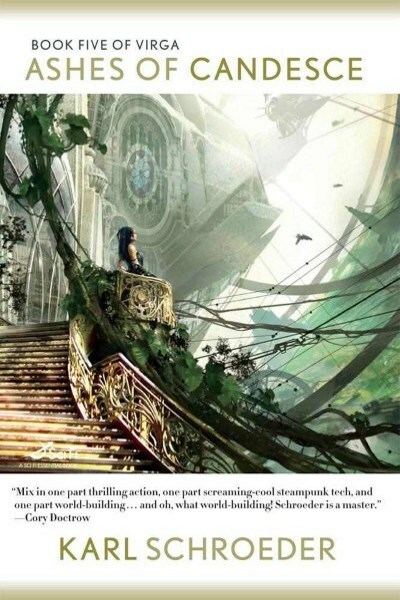 While the novel does meander a bit—the main plot points are not revealed until the reader is well into it—a riotous, action-packed ship battle at the end almost makes the whole experience worth it. 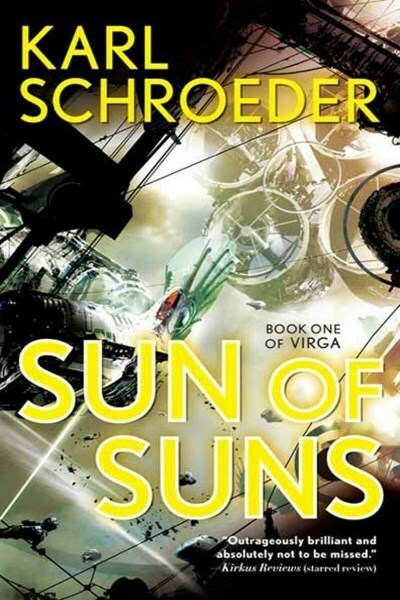 Add Sun of Suns to your reading list. It’s a five book series, so plenty of time for explanations of how things work later on. 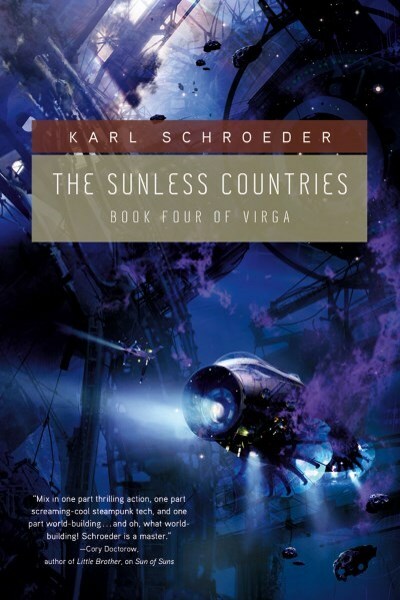 A list of interesting words I discovered while reading Karl Schroeder's Sun of Suns. The complete list of Tor's free e-book giveaways.